There is a special breed of fishermen known as "pier fishermen". These fishermen take pride in passing on their expertise to children and grandchildren. For many it is a treasured memory of family outings. North Carolina watercolorist, Jim Wordsworth built his first sailboat when he was fourteen. From then he was hooked! Traveling up and down the North Carolina Outer Banks with his family and later with his wife, Mary Lib, Jim saw the changes in the coastal area from rural, duck blinds, to slick tourist attractions. 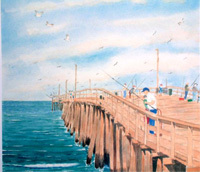 It is to these things that one is treated to a collection of coastal North Carolina art in watercolors. One can almost hear the silent sounds of the early Outer Banks, when there were no motels and only a few cottages, none with modern facilities but most with big, gorgeous porches, and laughter that traveled with the wind. A self-taught artist, Jim has had one-man shows in Beaufort, Rocky Mount, Chapel Hill, Cary, Wilson, and Kill Devil Hills, North Carolina.